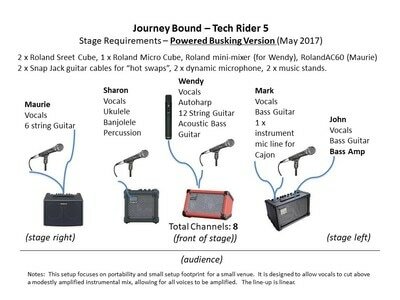 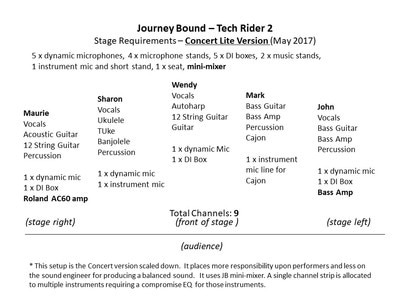 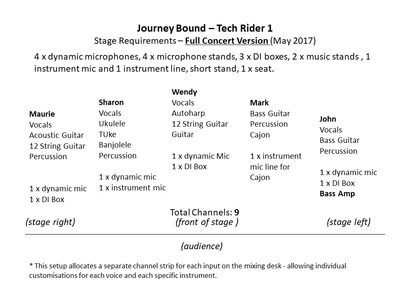 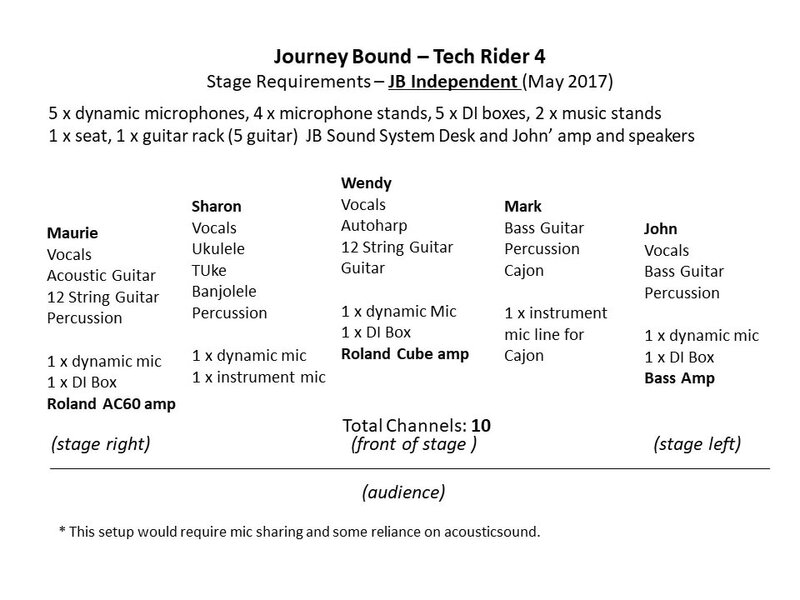 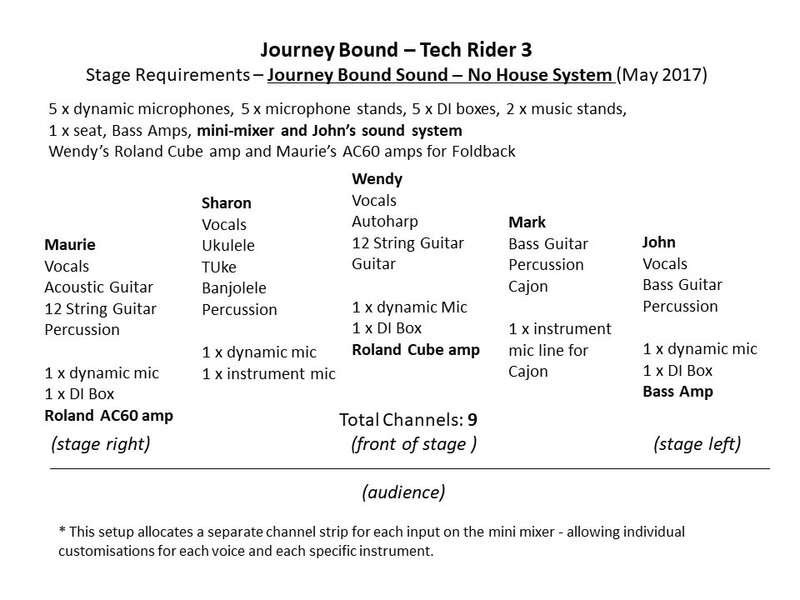 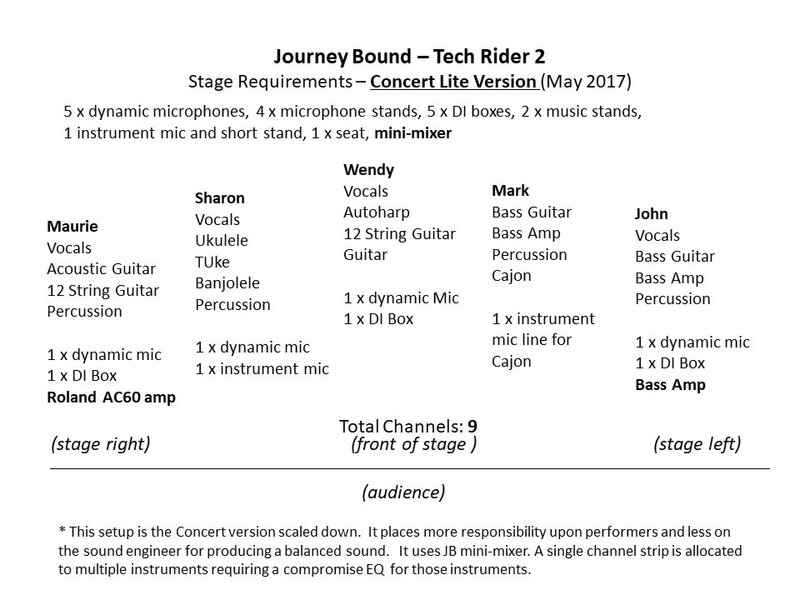 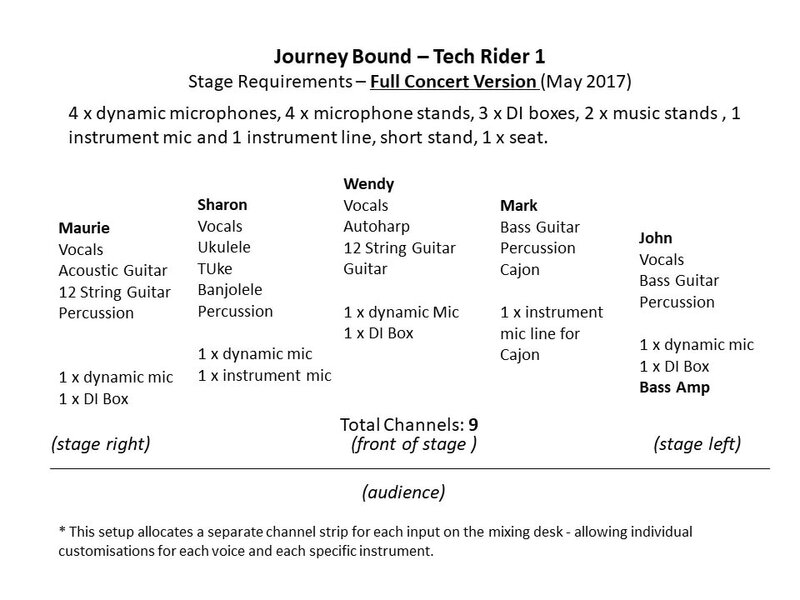 Included here are: reviews, a selection of photographs, a selection of descriptions, and a Tech Rider describing stage requirements. 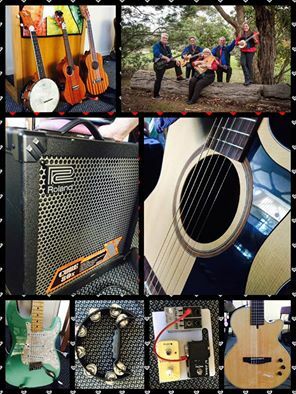 For details of our public liability insurance or any other relevant details, please contact us. 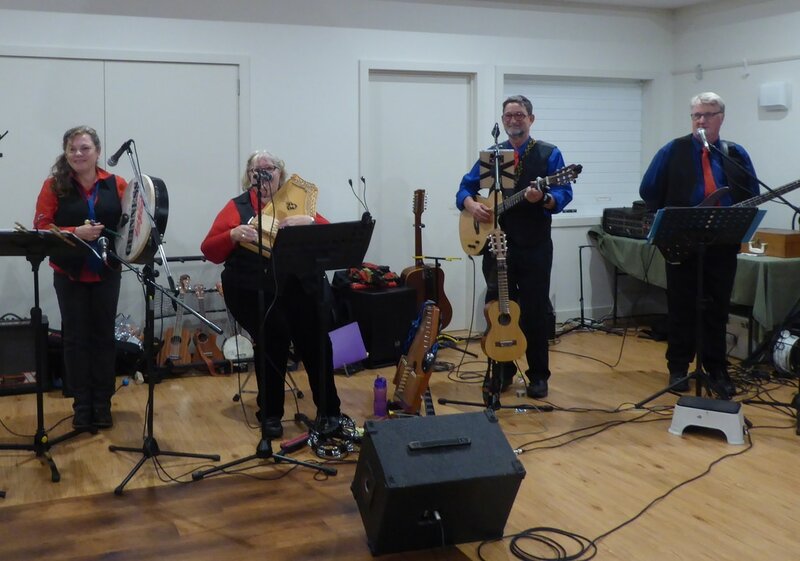 ".... those that did attend were absolutely spellbound by the standard of the three hour performance given by this extremely talented multi-instrumentalist group... the variety in their repertoire has to be seen to believed.... The audience aged from nine to probably 70, were absolutely enthralled by their performance... Few live performances like this offer something for everyone, but this one did, and many people made comment on this after the show." 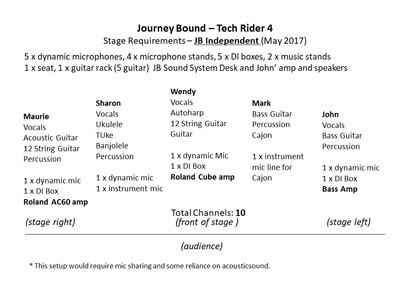 Able to leap tall genres in a single bound, Journey Bound is a versatile musical vehicle that likes to cover lots of different musical styles. 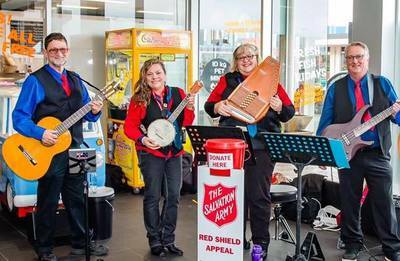 Travelling in Journey Bound are: Wendy Snook, Sharon Start, John Wilson, Maurie Richardson and Mark Symonds. 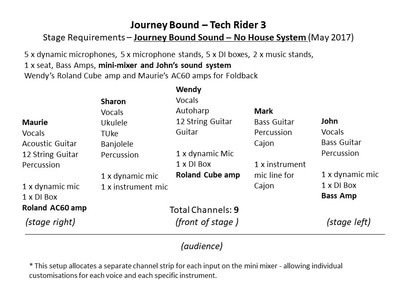 Journey Bound commenced as a group early in 2013 but the original tracks can be traced down many years prior. 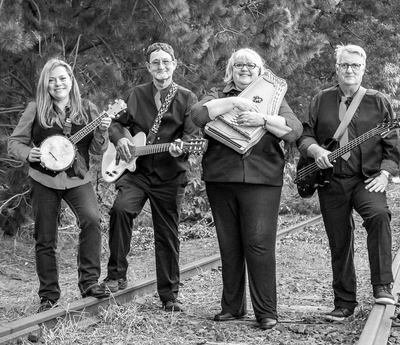 Together, they create a kaleidoscope of sounds that can be hard to define; incorporating instruments such as the Bodhran, Cajon Drum, Autoharp, Steel String, Nylon String and Electric Guitar, Ukulele, Banjolele, Acoustic Bass, Electric Bass, Harmonica, a myriad of "illegitimate" instruments including spoons, lagerphone and bones, all immersed in vibrant, spirited harmonies. There are the much loved Traditional, Gospel and Folk songs, but there are also traces of bands such as The Beatles and The Seekers. The music whilst occasionally serious, aims to be joyful. 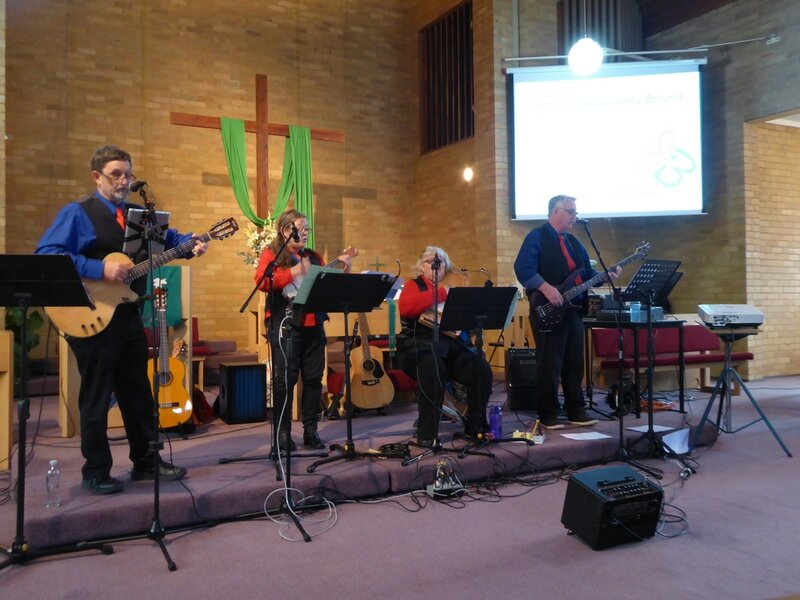 So come along and share some time with Journey Bound. 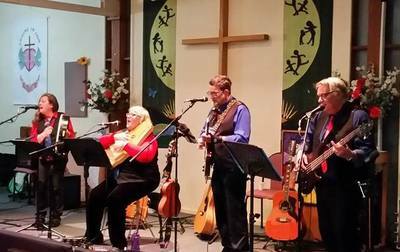 We're coming to a destination near you! 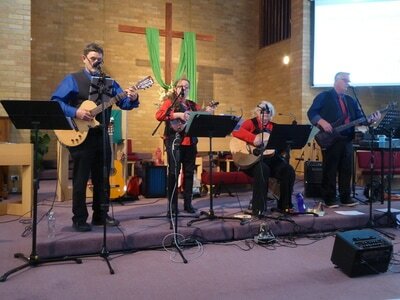 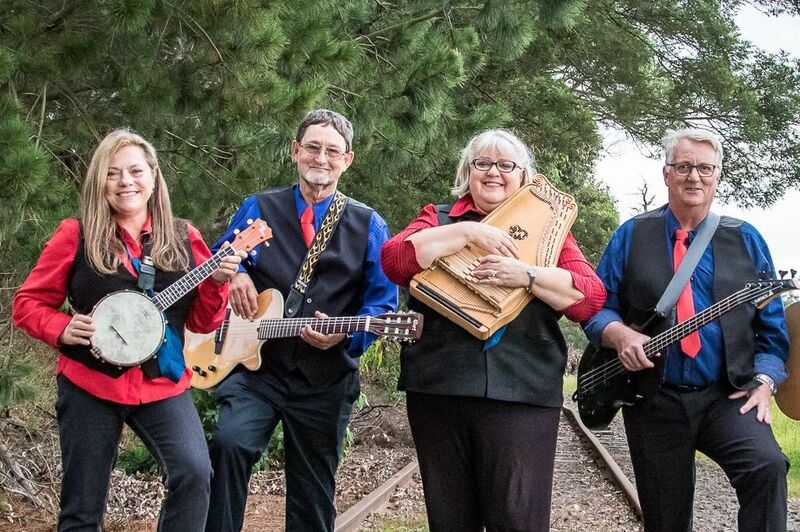 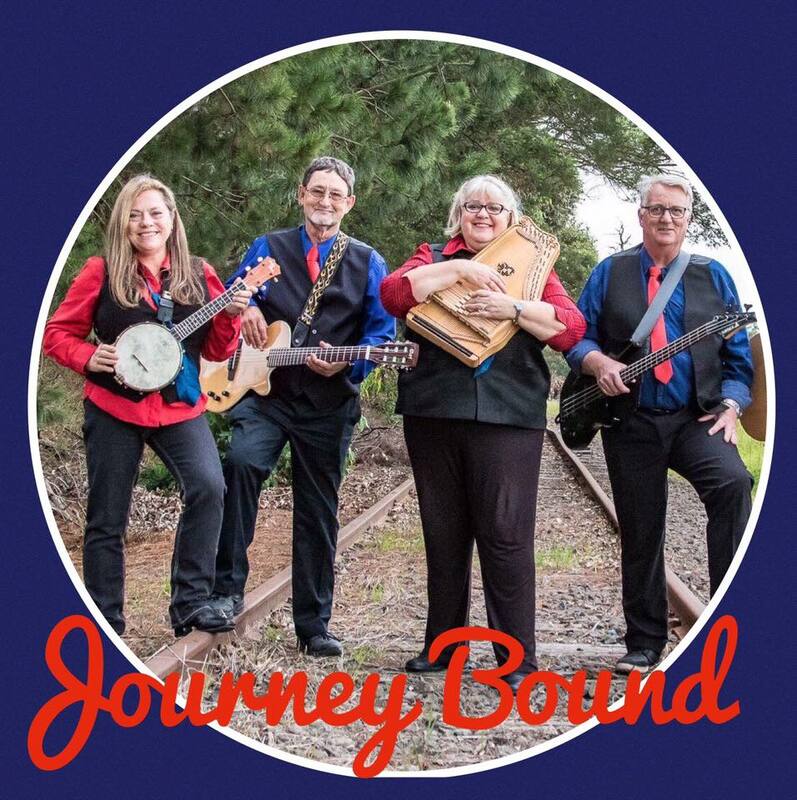 Able to leap tall genres in a single bound, Journey Bound is a versatile musical vehicle that likes to cover lots of different musical styles, including: Gospel, Folk, Pop, Country and even Rock all immersed in vibrant, spirited harmonies. 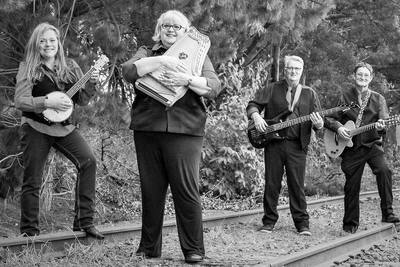 Journey Bound comprises: Wendy Snook, Sharon Start, John Wilson, Maurie Richardson and Mark Symonds. The music whilst occasionally serious, aims to be joyful. So come along, and share some time with Journey Bound. We're coming to a destination near you! 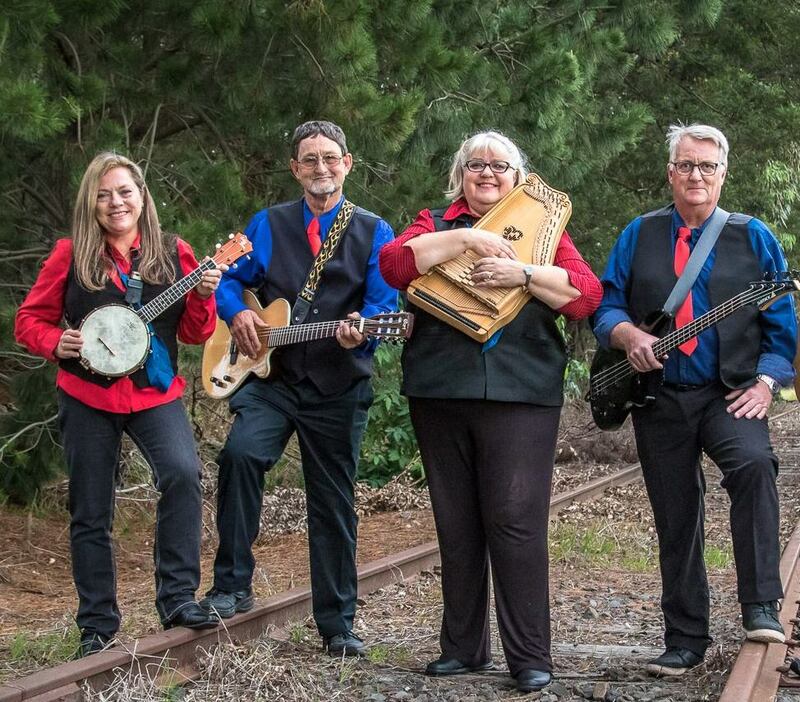 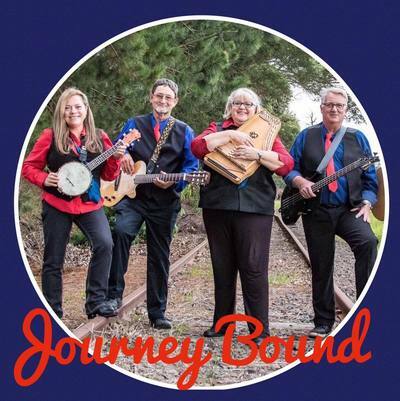 Based in Melbourne's South-East, Journey Bound is an Australian musical group that loves to play Gospel, Folk, Pop, Country and even Rock all immersed in vibrant, spirited harmonies.